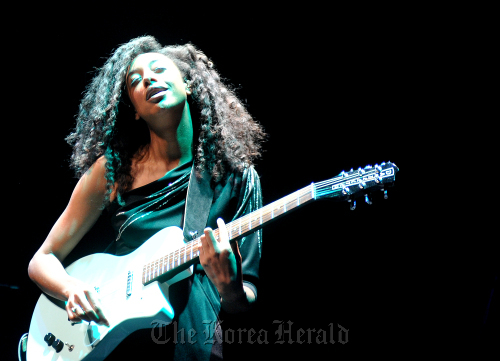 Even the polite Koreans’ patience had been running short during the 35-minute wait for Corinne Bailey Rae to appear. When she arrived, though, the British singer-songwriter’s irresistible smile, conversation with the audience and unbeatably soulful voice instantly killed any complaints. Performing her first solo concert in Seoul at Ax Hall on Thursday night, the 32-year-old appeared on stage wearing a black top, loose black pants and thin, flat golden shoes, about 30 minutes after K-pop idol IU sang two songs as the opening act. You could hear grumbles like “why hasn’t the band checked the amps in advance” and “is Corinne at the airport?” among the audience. However, shouting “I love Seoul,” Bailey Rae started off with “Are You Here” and the audience frantically cheered as if nothing that came before had really mattered. Sophisticated and sweet vocals filled the mid-sized concert hall where the floor was packed with people standing. At each end of the song, Bailey Rae thanked the audience by saying “Gamsahamnida” (Thank You) with perfect Korean pronunciation. The concert reached its climax when special guest IU made a surprise appearance on stage and joined Bailey Rae to do a duo for the famous song “Put Your Record On.” She immediately moved on to “Like a Star,” her 2005 debut single which brought her international stardom in 2006. The sessions ― drums, keyboards, bass and lead guitar ― were not bad but seemed a little bit lacking when it came to fine-tuning the amps and volume adjustments.